Skin Tightening. By contracting fat tissue. Collagen Stimulation. Which promotes cellular renewal, improves skin texture, fine lines and elasticity. The lifted facial contour will remain for about 12-15 months after the procedure, due to the collagen stimulation effects. Six months after the procedure PDO Threads will disappear because they are absorbable. Your skin cells are stimulated to produce new collagen, and new blood vessels to improve skin microcirculation. At the same time, The PDO Threads cause the fat tissue to contract and produce the skin tightening effect. Are There Different Types of PDO Threads? Smooth Threads are used to stimulate collagen. Barbed Threads are used to lift and reposition the skin. PDO Threads come in different thickness and length. These all affect their quality, tensile strength, effectiveness, and of course, price of your treatment. Vita’s Medithread provides the strongest threads on the market. Your doctor may choose to use different kind of threads for you, depending on your rejuvenation and skin lifting needs. What Areas Can be Treated with PDO Thread Lift? The PDO Thread Lift procedure is designed according to what you want to treat, and which areas you want to concentrate on. PDO Threads can be used for lifting, rejuvenation (improving skin texture and wrinkles), volumizing, and even reducing fat. Different threads are used for different purposes, so the possibilities are endless. In about 6 months after the treatment, the threads would have dissolved, but the results will continue. Depending on your needs your practitioner may recommend repeating the procedure 6-9 months after the first procedure, to allow for a long-lasting result. Am I Suitable For a PDO Thread Lift? The PDO Thread Lift is an effective treatment that is suitable for anyone looking to improve the appearance of sagging skin. 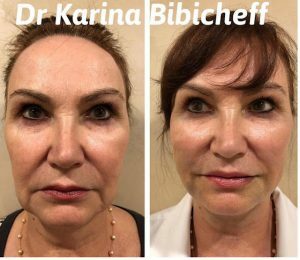 This treatment is suitable for someone who is willing to undergo some injections, and who wants to attain an immediate lift and a facial contour without undergoing an invasive surgery facelift. It is best suited for men and women who are unwilling to tolerate the long downtime of a facelift surgery but want to look refreshed and rejuvenated. PDO Threads are inserted into the skin with sterile needles or cannulas. Once inserted, the barbed threads anchor to the skin and the practitioner contours the face. The excess threads are then cut off. Depending on the areas to be treated, the procedure may take only 15-30 minutes to contour. Is PDO Thread Lift Safe? This treatment is safe and the side effects are, in fact rare which is what makes PDO Threads so innovative. MediThread PDO Threads are inserted with needles and are absorbed in 4-6 months. Medithread’s PDO Threads have minimized if not eliminated any of the side effects associated with the older thread lifting procedures, such as infection and thread breakage. What to Avoid Before and After a PDO Thread Lift Procedure? Three days before the procedure, like other treatments involving injections, avoid alcohol, supplements such as Vitamin E, Omega Fish Oils. Two weeks after a PDO Thread Lift procedure you are also discouraged from undergoing any dental treatment (which requires you to open your mouth excessively) It is strongly advised to sleep on your back to help the swelling to subside and to avoid the putting pressure on the face.